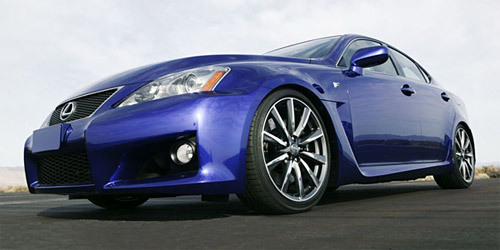 From the Japanese mag BestCar to Winding Road to you comes a rumor of the Lexus IS-F/R, a lighter and slightly boosted version of the super sedan. The specs, as reported, will see the IS-F’s weight cut down by 220lbs, and a performance boost of 12hp and 6 pound-feet torque increase, bringing the totals to 429hp and 376 pound-feet. Its suppose to be a very-limited edition version of the IS-F and come with a carbon-fiber roof and heavy usage of aluminum, carbon-fiber, and magnesium components to dramatically reduce weight. The original article said “over” 100kg(220lbs) reduction in weight. The devil is in the details, however, and this limited edition IS-F/R could cost close to $90,000USD, 30% more than the expected “base” IS-F. I’m not sure I understand such a drastic price increase, though at this point it’s all conjecture.